ThatDamnCat designs: Crafting with Kids: Barbie"house"
As I was digging through my mother's attic I came a across an old, tattered box of barbies. The lid was flat, the box was barely holding the weight of it's contents. Oh, yeah, it was boring and blue. I don't do boring, neither does the girls. So with some glue, tape, gift-wrapping paper, pens and stickers the girls and I gave the barbies a new home. A really fancy one, too, with paintings on the wall and a roof in all the colors of the rainbow. Yes, all except four of these were mine, unexpected, huh? 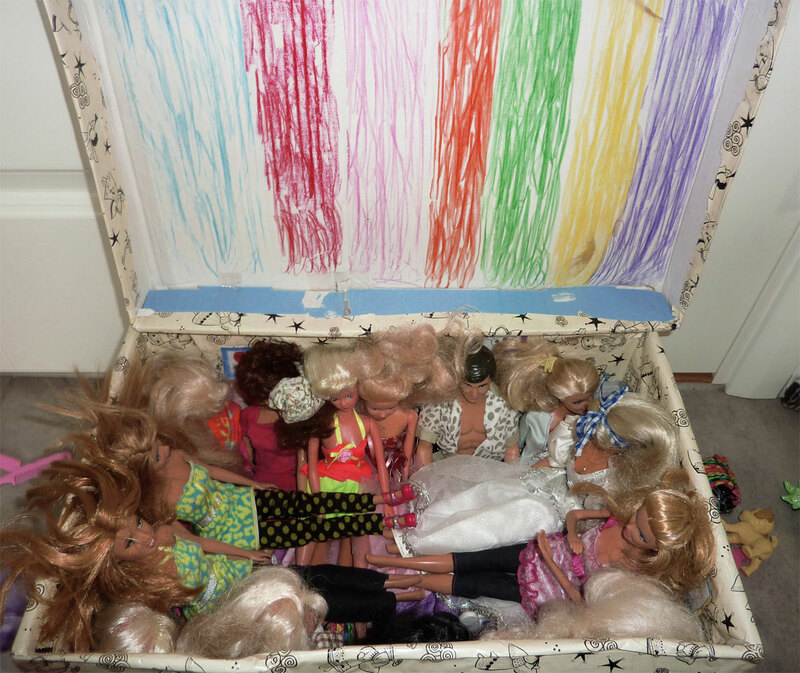 So with a new home (A bit crowded, but just think of it as a summer cabin, haha ) and new friends all the dolls was finally out of the dark attic and got their hair brushed by girls who looked like they won the lottery. I'd say that's a pretty good destiny for old toys and a tattered old box.